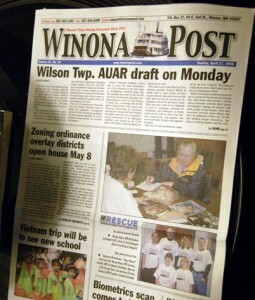 You are here: Home / OPR News / OPR had a successful trip to Winona, MN! OPR had a successful trip to Winona, MN! Operation Photo Rescue was in Winona, MN April 25th and 26, at the Winona County Historical Society. It was a successful two days, based on the help we were able to provide to the flood victims of that area. Overall, we collected 415 damaged photos from 30 households, had 5 TV stations run news stories on us, and we obtained several new volunteers! We have generally told people to expect the turn around process to be anywhere from 6-12 months, based on our limited volunteer resources. However, as our volunteer base continues to grow, we hope to be able to significantly reduce that time period. We have also received some photos from California, from those who had photos damaged in the fires last fall. Meanwhile, I am keeping very busy with sending photos off to be printed, primarily from the Biloxi, MS and Coffeyville, KS areas. Most of these photos are being printed by Mpix (www.Mpix.com), which has been doing a fabulous job with a very fast turn around time! We still have some photos pre-Biloxi that remain outstanding, but I am working diligently on those, so that we can get these photos mailed back to their owners ASAP. Our volunteer base continues to grow, and as of today, we have 631 volunteers who have or continue to work on photos for OPR. Our forum remains busy with discussions of restoration challenges, cameras, wildlife, and life in general. We’d love to have you join us as a volunteer! Please see our main website at www.operationphotorescue.org to sign up, or to donate! This was a great trip and I’m glad it was a success!